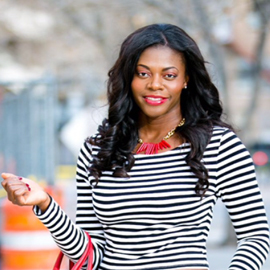 Hello Yvonne: Ankara with a Forever Find! My mommy was in town this past weekend for my graduation and I could not have been happier because she is my favorite person...hubby too! I'm sure like most mothers, she will do anything for me and one of the smaller things she did was have some Ankara wear made for me. Ankara clothing can be described as using typically African influenced vibrant fabrics, sewn into more modern "westernized" styles. I got this simple pencil skirt which I paired with a plain satin white shirt and my $30 sandals I'd recently found at forever 21 & love. My mom and I had fun taking the pictures and I think more than the outfit, I love the memory from our shoot on this hot day. Skirt- Ankara made (Similar on sale here), Shirt - H&M (Similar here), Shoes- Forever 21 (Similar here), Clutch- New York & Company[old] (I like this here), Sunglasses- H&M (Similar here, here). Gotta love Ankara! Love those heels. You look beautiful! Yes love Ankara! Thank you very much! You are right about that giddy feeling Joy! & thank you lots!! I love your skirt! You look fabulous! I am super close to my mom too, glad that you enjoyed having your mom in town! Congrats Yvonne, on your graduation. Never can go wrong with the ankara! Moms are great! So happy that you got to spend time with yours! Love your outfit! You skirt is just amazing! Aww thanks so much Rebecca!